To each his own. But, may be if you didn't smoke so many bowls in the woods you may shoot straighter? And just what did you think those woodland creatures do all day? the legal kind leech!!!!!!!!!!!!! none of that stuff del, boar and reb smoke!!!!!!!!!! Do you inhale pipe smoke? thats kinda a personal question aint it???????????????? Took a picture of him as he was looking at me. So................... is this a 1 time thing .............................or do you have a new hobby? Ya gonna try wraslin other critters too? my next is a big old pike!!!!!!!!!!!! nope 1 time thing. after wrastlin with just his horns and neck the buggers are strong as an OX i think i paralized him with my shot placement!!!!!!!!! you know sharp shooter Glwnn!!!!!!!! Sharpshooter=one shot, neck twist, beat him over head, and punch him out, right? Hi guys, nice bucks. Good to see people are getting bucks and seeing deer. We saw quite a few deer and a lot of them were bucks. The bucks weren't running does (well one chased a doe and fawn right to my tree) but they were on their feet during the day time checking scrapes and just cruising. 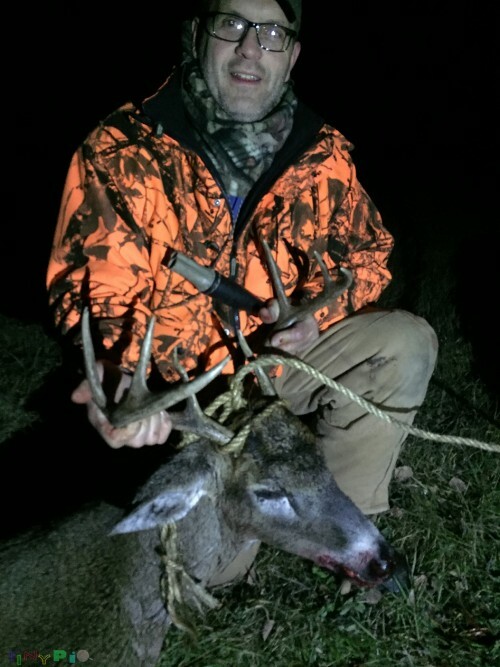 My sons friend shot a nice 8 on Saturday, I shot a thick horned 8 on Sunday and brother in laws friend shot a 9 point yesterday. My son and grand son watched a respictable 8 go under them on Saturday but my grandson decided to wait for a bigger one. (Yes, he's 12 and spoiled as far as deer hunting goes). He did have a chance on Sunday but missed a big one on a tough shot. Rain and snow sucked yesterday after noon and this morning. Yesterday afternoon I scouted spots for a couple enclosed blinds that I aquired from a neighbor. Also, pulled or marked some buckthorn. Got soaked but was fun. Didn't carry a gun so the deer I saw were not to concerned about me being in their neighbor hood. I will post some pictures after voting. Another beautiful morning at the "office". Spread the olive oil (or spray) on the inside of a slow cooker. Place the venison roast inside, sprinkle with seasoned salt, and cover with apple, onions, and garlic. Turn to Low, and cook until the roast is tender, about 6 to 8 hours. When the roast has cooked, remove it from the slow cooker, and place onto a serving platter. Discard the apple. Stir the water and bouillon into the slow cooker until the bouillon has dissolved. Serve this as a sauce with the roast. The Apple helps take some of the gaminess away from the venison plus helps make it tender. Son's friend on Saturday evening. 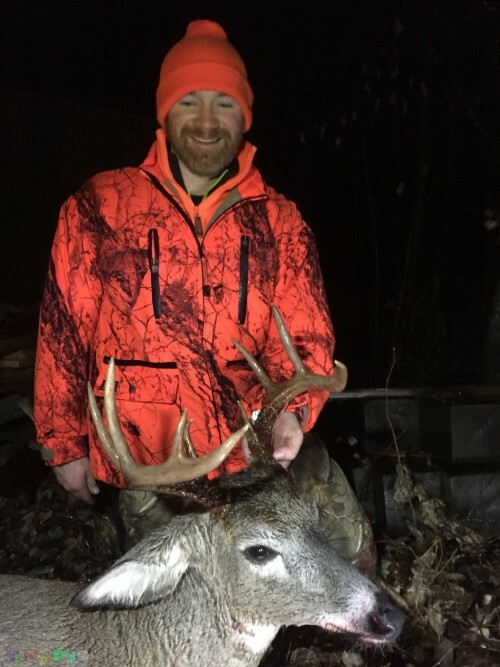 His biggest personal best as far as big deer go. It's a nice 8 point and weighed 185 pounds. Sunday morning I caught this guy checking a scrape. I didn't know the scrape was there until I went to see if there was a blood trail. The shot was a little forward but there was no problem following the blood trail, however he did run out of sight probably 100 yards. Like glenn57's deer, this one was still alive when I approached it. It jumped up but went head over heals because it didn't have use of the front legs. I knew it couldn't last too much longer due to blood loss, so I waited for it to expire. 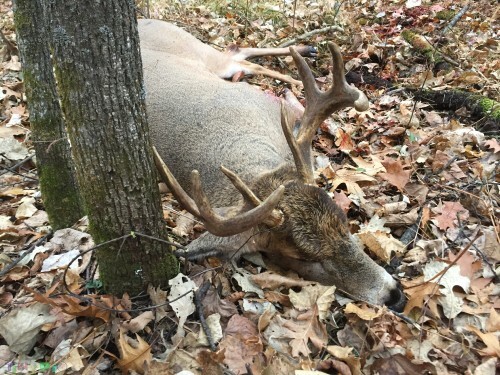 Yes, a bit sad but the same would have happened if I waited longer in my stand. This one weighed in at 185 pounds. 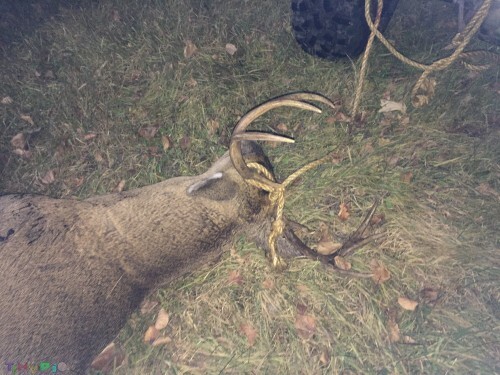 nice deer deadeye................................. and ITS WAY BIGGER THEN BOARS!!!!!!!!!! Brother in Laws nephew's 9 point, 172 pound buck. Also, his personal best deer. Happy hunter. Put him in the stand I planned to hunt on Saturday afternoon and, boom. Just as well because I'm not sure what I would have done. Couldn't wipe the smile of this guy all night, even when soaking wet. Took this this morning and just thought it had a good "deer camp" look about it. I now what I would have done. Sunday afternoon my grandson, Evan, and I headed out for an evening hunt. 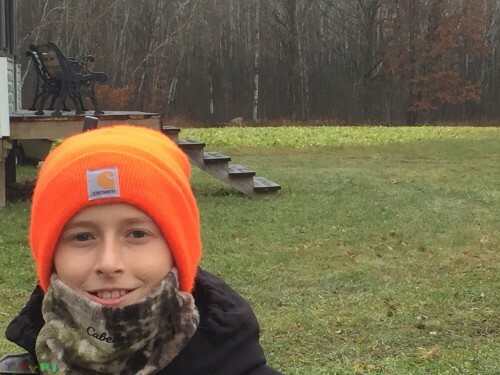 As we left the cabin I ask him if he wanted to shoot the deer in the field behind him. He said it wouldn't be very sporting to shoot one eating by the cabin so we just walked on down the field. 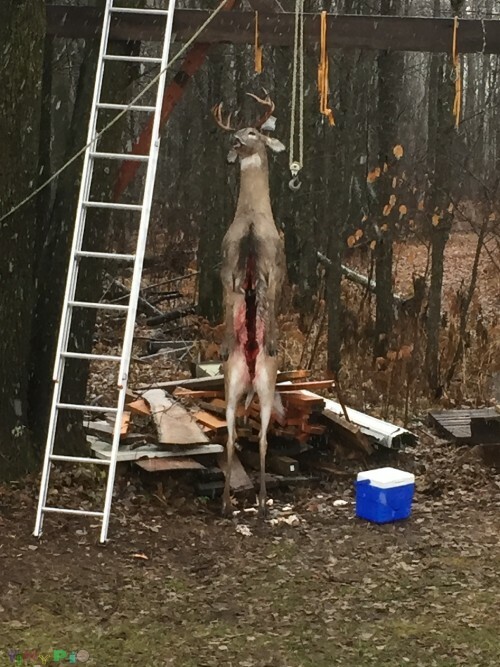 On Saturday he let a respectable 8 point walk under the stand. He said he would wait for a bigger one. deadeye...............are you in a slug zone or do you get to use the big guns?????? i dont ever recall you saying? 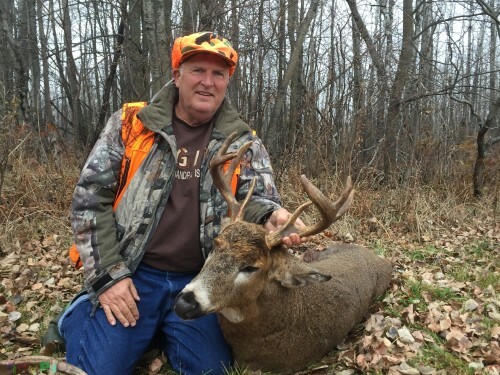 Nice looking bucks deadeye. All your hard work continues to pay off! dang good deadeye!!!! yes you are reaping the rewards of your hard work!!! glenn57, I am in the rifle zone. However, most shotguns are bigger than a rifle cartridge. Yes, we do put in a lot of work getting things ready for hunting. It's pretty much a year round thing. Yesterday afternoon I left the gun at camp and scouted locations for two enclosed blinds that I got from a neighbor. Along with scouting, I searched for any remaining buckthorn along the way. I purposefully cut through an area we seldom go through (bedding area). I found 9 buckthorn plants five of which I pulled and 4 marked to be killed later. I did encounter one deer that must have wondered just what the heck I was doing in her bedroom. We did a 30 yard stare down for about 15 seconds before she scampered off. I did find and mark two locations along the swamp edge for the blinds. Got wet feet because I went too far out in the swamp but it was fun just checking out spots I don't usually get to. I miss judged the time and it was very dark when I got back to camp. Being I did not bring my pack, I had no lights. It really gets dark fast in the woods when it's raining out. I told you those tamed Yard Deer were easy and no one wanted them a month ago! Found my bullet in the neck!